The 2016 Legislative Session of the Indiana General Assembly passed Senate Enrolled Act 147 requiring the Indiana Department of Homeland Security (IDHS) to establish minimum standards and approve best practices no later than 1 July 2017 for a school emergency response system. The new guidelines are helping to improve school safety and security across the state and offer a template for other states to consider when reviewing and updating their emergency response systems. Systems designed to improve technology and infrastructure on school property that may be used to prevent, prepare for, respond to, and recover from a manmade or natural disaster or emergency occurring on school property. The legislation was written in such a way that provided IDHS flexibility to develop a product that best addressed the legislative requirement. As mentioned in the definition above, it was important that the product addressed an all-hazards approach to school safety, which would more effectively address a well-rounded emergency response system. The legislation required IDHS to simply develop guidelines, rather than requirements for schools to follow. This has allowed Indiana schools to be flexible with their implementation of the guidelines. It was essential for state government to include external stakeholders in both the public and private sectors to ensure that the developed guidelines included the most appropriate information and was developed with input from around the state. The product working group involved nine Indiana professional associations related to public safety and education, federal professional associations, and state government agencies that brought important perspectives into the decision-making process (all partners are listed on page 1 of the document). This group brought together approximately 20 individuals who met four times throughout 2016 and the first half of 2017 to implement a strategy, discuss and debate product content, and ensure that a well-rounded safety and security document was developed. These five topics are expanded upon within each of the 17 components. One of the consistent themes of the product is “people over products.” The group acknowledges the importance of physical tools for safety and security (e.g., doors, locks, windows), but without training these tools are less effective. Putting the focus on the people involved in school safety emphasizes building relationships with first responders, preparing uncommon stakeholders (e.g., facilities staff, parents, bus staff) for emergency situations, and identifying methods of utilizing the large student population as a trained safety and security mitigation tool. On 1 July 2017, the project working group successfully developed a product that has been disseminated around Indiana. To share this information, professional associations, local emergency management agencies, and IDOE were utilized, and a copy was posted for the public on the IDHS website. The legislation not only required IDHS to develop guidelines, but also maintain them. No specific maintenance schedule was provided, but IDHS determined that an annual review of the product was appropriate and would disseminate an updated product on 1 July 2018. With the 2017 product released, it is important that IDHS request feedback from individuals who work in and around schools on a daily basis. To do that, the IDHS needed to get into the communities and talk with its partners. This socialization initiative is helping to gain statewide agreement and support for the included content, to guide content, and to direct the future of this product. IDHS identified County School Safety Committee Meetings, held in each Indiana County, as the best method for receiving product feedback. Meetings occur at the discretion of the committee, some on a monthly basis, whereas others occur once per year. County commission meetings bring together representatives from the schools, first responders, local government, state government, and relevant private industry. Through the end of 2017 and into early 2018, IDHS intends to attend county commission meetings around the state to elicit input. Through December 2017, IDHS has already attended 10 county meetings in various parts of the state. The important feedback received has seen information added to the National Incident Management Systems trainings that is specific to school employees and addresses the importance of providing safety training to part-time or contract staff. The project working group will continue to play a critical role in the development and revision of this document. The working group will review any information included in this document to maintain transparency and collaborative input. Robert Quinn currently serves as the Indiana State continuity director for the Indiana Department of Homeland Security. In this position, he leads the IDHS school safety projects. Working with school safety specialists from around the state, he has been able to facilitate the coordinated efforts to create school safety guidelines assigned by the Indiana Senate Bill 147 (2016). He has been involved in addressing school safety topics such as architectural design and renovation of schools within Indiana, providing additional hazmat and radiological awareness information, improving both higher education and K-12 event management preparation, and assisting in the development and implementation of a statewide higher education/emergency management consortium. Although the building and fire code community has clearly ruled that these barricade devices do not meet the necessary egress and fire safety requirements, their seemingly blatant violations of federal laws have yet to be litigated. The ADA is a federal law that prohibits discrimination against people with disabilities and sets standards for accessible access and egress. Classroom doors nationwide are required to comply with the ADA, and it is unclear how several states have adopted codes to permit use of devices that are so obviously in conflict with a federal law. The installation of a barricade device on a classroom door is clearly discriminatory to those with physical or visual impairments, it impedes egress, is not located 34 to 48 inches above the floor, requires more than one action to release the door and as a result is in clear violation of standards and laws regarding accessibility. Whether school administrators choose to adjust security protocols incorporating existing locks, install classroom security locks or invest in electrified locks that can be secured remotely, code-compliant solutions are available. Not only will schools not save money by installing inexpensive barricade devices, they expose themselves to a number of new liabilities as well as potential fines for ADA violations. The recent changes made to the model codes should help establish more consistent requirements for classroom security. However, when working to increase the security of an educational facility or any type of building, it’s vital to ensure safe access and egress for all occupants during any type of emergency — not just active shooters and terrorism, but also fire, severe weather, natural disasters and other types of emergencies that schools are statistically far more likely to face. States must adopt standards for securing school facilities that meet all relevant laws and codes. Those standards must create secure environments while ensuring the safety of all occupants — and they should do so without turning our schools into prisons. Contrary to what the purveyors of barricades may claim, those standards can be easily implemented, affordably, using legal and code-compliant hardware. It is irresponsible to make it difficult for anyone, regardless of their ability, to flee a hazardous situation. It is equally irresponsible to allow the use of locking devices that could be deployed as barricades by someone seeking to do harm to others. Schools house our most vulnerable population, our children, and their safety should not be jeopardized by misguided efforts to enhance security. Robert Boyd is the executive director of the Secure Schools Alliance. He can be reached at rboyd@secureschoolsalliance.org. The views expressed by guest bloggers and contributors are those of the authors and do not necessarily represent the views of and should not be attributed to Campus Safety magazine. School security advocates demanded more guidance from the government as findings of an ongoing study on state school security requirements revealed minimal standards that vary widely. Advocates called for the creation of an independent federal school security board or National Center of Excellence during an event on Capitol Hill June 28. They stressed that such an organization would be a good way to organize guidelines and best practices for people making school security decisions. “A National Center of Excellence for School Safety could be that hub for research, training, intellectual exchange and a place where people can go to ask questions and get resources,” Dr. Erroll Southers of the Sol Price School of Public Policy at the University of Southern California said at the Security Industry Association’s GovSummit event. The demands followed the release of preliminary findings from a comprehensive analysis of school security requirements. 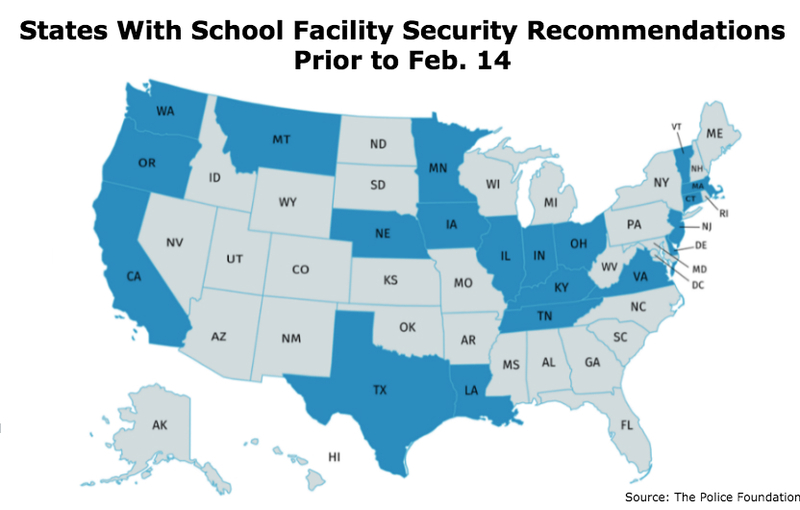 The study, which is being conducted by the Police Foundation, shows only 15 states had some type of school facility security requirements prior to the Parkland, Florida shooting (see map on top of article). The study also shows that many state legislatures are actively discussing school security measures. Additionally, the study found that very few of the states with requirements have outlined clear repercussions if schools don’t meet those requirements. The number of states with school security requirements may be discouraging to some, but since the Feb. 14 shooting at Marjory Stoneman Douglas High School, the Police Foundation found state legislatures across the country have begun considering the issue. But despite that activity, very few states have actually passed legislation since February 14. The study also found that 20 states had general exercises, toolkits and training prior to the Parkland shooting but far fewer had publicly-available guidance for schools to follow to secure their campuses. Gorban says there’s been a lot of focus on safety initiatives like anti-bullying and anti-drugs but not as much on school security regulations. The Police Foundation does not advocate for any particular policies. The Secure Schools Alliance (SSA), a non-profit group of security industry, law enforcement, public safety and education officials, organized the Capitol Hill event and funded the Police Foundation’s research. Guidelines, assessment tools, toolkits, resources, etc. In 2016, lawmakers launched the School Safety Caucus to facilitate those talks and look at the best ways for schools to keep student safe. The Police Foundation found that Delaware, Rhode Island and New York have passed school security legislation since Feb. 14. Florida has also passed a sweeping law that deals with school security, and Maryland passed a law that bolsters school emergency preparedness and mental health resources. The federal STOP School Violence Act was passed in March. Campus Safety has written about large initiatives by state governors to improve school security in states like Texas. These initiatives often come in the wake of tragedies. The National Fire Protection Agency’s newly-released active shooter guidance can be used by schools. Scott Breor, the director of the Protective Security Coordination Division of the Department of Homeland Security, assured the GovSummit’s attendees that government officials are working hard to support K-12 schools. Tim Eckersley, the president of Allegion, which partners with SSA, said at the event that a national board should be investigating and learning from each one of the recent tragedies in U.S. schools. Are K12 Schools Really Safe?